Assault, sneak, or both? The choice is yours in these multiple-route gems Deus Ex fans will likely enjoy! These days, players often demand freedom of choice in their games. For some, it’s not good enough to run into a room with guns blazing. That’s great and all – but how about sneaking options and stealth kills, or distracting enemies away from your path? In light of this, we’ve decided to put together a list of games that give you the freedom to decide your own play-style – with a specific focus on multiple route games like Deus Ex : Mankind Divided. Building on past installments, Deus Ex : Mankind Divided permits plenty of freedom for you to choose your own path through the game. Most specific situations can also be resolved in multiple ways. For example, areas are designed with numerous air vents, side streets, and crawl spaces, together with tons of hackable consoles and unlockable doors. These give those with a penchant for stealth lots of options to sneak past enemies, totally undetected. Alternatively, you can also barge in armed to the teeth with heavy weaponry and augmented bio-upgrades. In short, games like Deus Ex : Mankind Divided empower you to pick how you want to play them. Each game offers multiple routes through levels / sections, giving you the option to be stealthy, use brute force, and so on. Levels are also large and/or varied in their designs. Locked doors, hidden ducts, and all manner of secret passages are an optional plus, along with scattered guns and other weaponry. Whilst some degree of direct assault is usually inevitable, each game should let you resolve some (not all) situations without the need to fire a single shot. So, no firefight shoehorning – not all the time anyway! Multiple playthroughs and/or play-styles are rewarded. It’s all well and good to let you complete a level using different approaches and routes. However, these games like Deus Ex : Mankind Divided offer special rewards for your varying styles, too. Perhaps your character learns new skills or gains access to new weapons? Whatever it is, these games will give you real incentives to replay and try new things. This has to be the Granddaddy of ‘do it your way’ level design. We’re looking at the new episodic Hitman in particular, which easily hits all our selection points. Playing as Agent 47, you’re given targets that need to be taken out. Sometimes there’ll be secondary objectives (steal a folder, smash a vial of germs, etc.) but the long and short of it is ‘finish your kill list’. Like most games like Deus Ex : Mankind Divided, you’re free to make your own choices in every stage. Level designs are huge with tons of locked doors and hidden pathways. In addition, you can even steal disguises from NPCs that litter the levels. Want to gain access to a restricted area? Knock out that guard and dress yourself as a VIP. Stay vigilant and you’ll be able to swan around everywhere like you own the place. You can also choose to take out targets, assassin style. Subtle approaches like poisoning your target or setting up elaborate booby-traps are just some options. Alternatively, there are also more direct weapons available, including pistols, explosive rubber ducks, sniper rifles, and so on. Hitman also has tons of replay value. Finishing each level will reward you with extra upgrade points, fresh disguises, and tons of new weapons to try out in multiple ways. 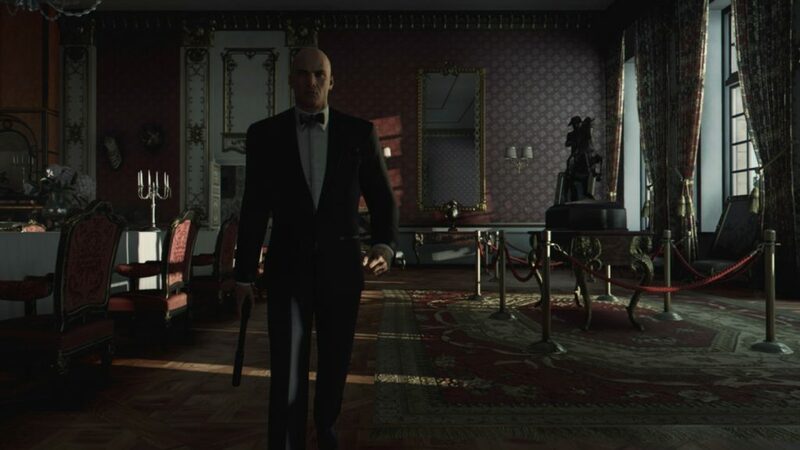 In short, Hitman is a perfect example of games like Deus Ex that give you the flexibility to decide how you want to play. Read more honest player reviews of Hitman. Dishonored takes the Deus Ex formula but places you into a steampunk world where whale blubber is a valuable commodity. No, really. Akin to most games like Deus Ex : Mankind Divided, the levels here are big and offer multiple opportunities for creeping, sneaking, or just straight out combat. 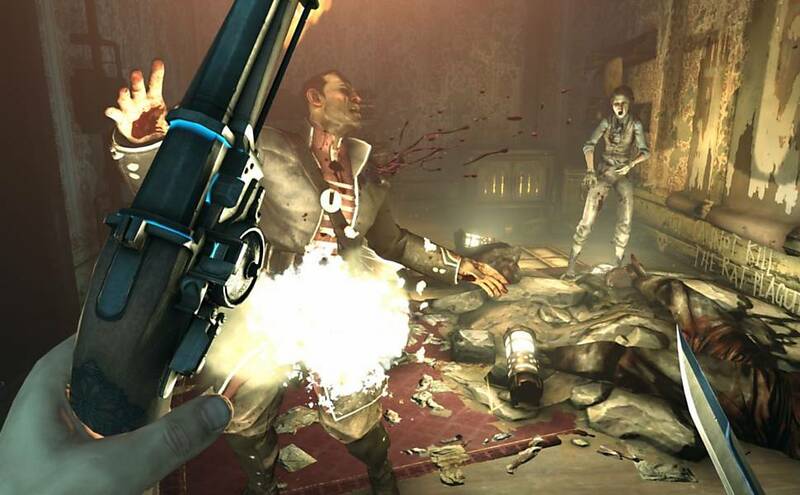 Dishonored does have some guns, although there’s a particularly heavy emphasis on melee. A bit like Deus Ex, you control a kinda similar character named Corvo Attano with even more over-the-top superhuman abilities, including the power to stop time, possess enemies, and direct a swarm of attacking rats. Dishonored also rewards multiple playthroughs, with different routes leading to various endings and even more new powers to unlock. The good news? The brand new Dishonored 2 is set to be released in the coming months! Read more honest player reviews of Dishonored. 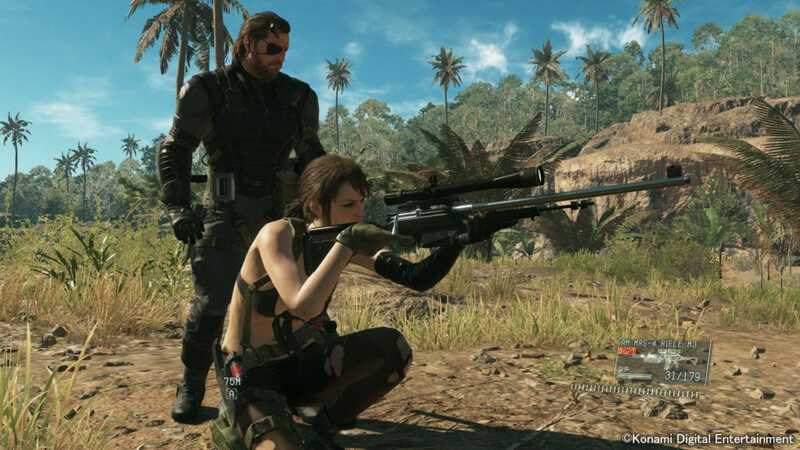 It’s incredible to see the Metal Gear series transition from its semi-linear gameplay into a huge open-world espionage action-game. Indeed, the newest Metal Gear Solid V: The Phantom Pain is filled with more sprawling areas than most games like Deus Ex. Some stages are so large that you’ll even need a pair of binoculars to spot distant enemies. There are many ways to approach each mission. For a start, you’ll need to decide your loadout. This includes selecting what weapons you want to carry, what camo to wear, and which partner you want to accompany you. You’ll also have tons of goodies to unlock Some are more aggressive (e.g. rocket launchers! ), others a bit sneakier (e.g. advanced cardboard box technology). 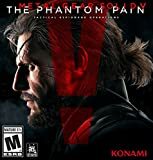 Overall, Metal Gear Solid V: The Phantom Pain definitely encourages multiple playthroughs with tons of upgrades and Easter Eggs thrown in. A must-try among games like Deus Ex! Read more honest player reviews of Metal Gear Solid V: The Phantom Pain. With its huge open world, Fallout 4 is full of secrets to discover with ample opportunity to approach missions in your own unique way. In fact, you may even miss entire side quests because of the sheer abundance of things to discover and routes to take. Like other games like Deus Ex : Mankind Divided, you can talk your way out of trouble, hack security systems, and use stealth to your advantage. Outright assaults are possible, although In some cases combat may be entirely avoided. The game also begs for multiple playthroughs. For example, Fallout 4 is full of warring factions, giving you the right to choose which side you want to back (if any). Your decision means you’ll gain access to some missions and not others, thus inviting you to reload old saves and see where things take you. In sum, Fallout 4 stands strong among games like Deus Ex for its flexible approach to gameplay. 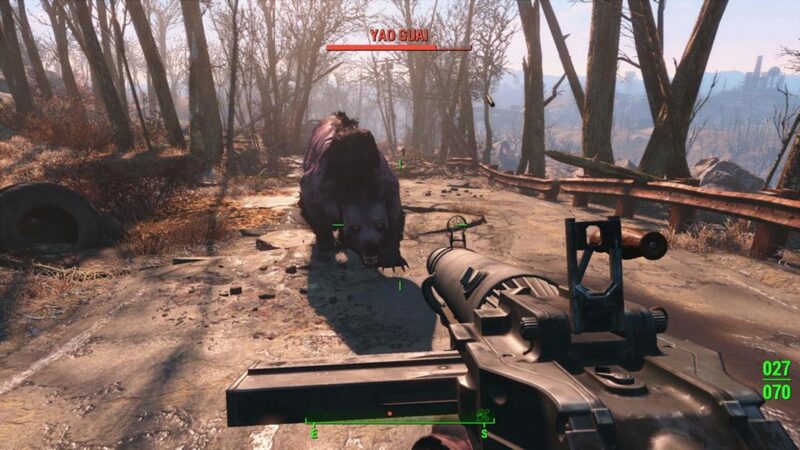 Read more honest player reviews of Fallout 4. Adam Jensen often treads into morally dubious territory. That’s really half the fun since you’re free to decide what’s right and wrong, choosing between passivity and aggression. This virtuous ambiguity is all the more amplified in Vampire: The Masquerade – Bloodlines where you play as a vampire… who thankfully isn’t as sparkly as Edward Cullen. Admittedly, Vampire: The Masquerade plays very differently to most games like Deus Ex : Mankind Divided. It’s more akin to a traditional action RPG where you’ll gain experience points and level up along the way. The world is also made up of several hub locations with some good-sized areas to explore. However, how much you get to wander around town depends on what type of vampire you choose to be. One of the big choices you’ll get to make is during Character Creation. Are you going to be a Nosferatu type vampire striking fear into the hearts of the public, or maybe try your best to blend in instead? 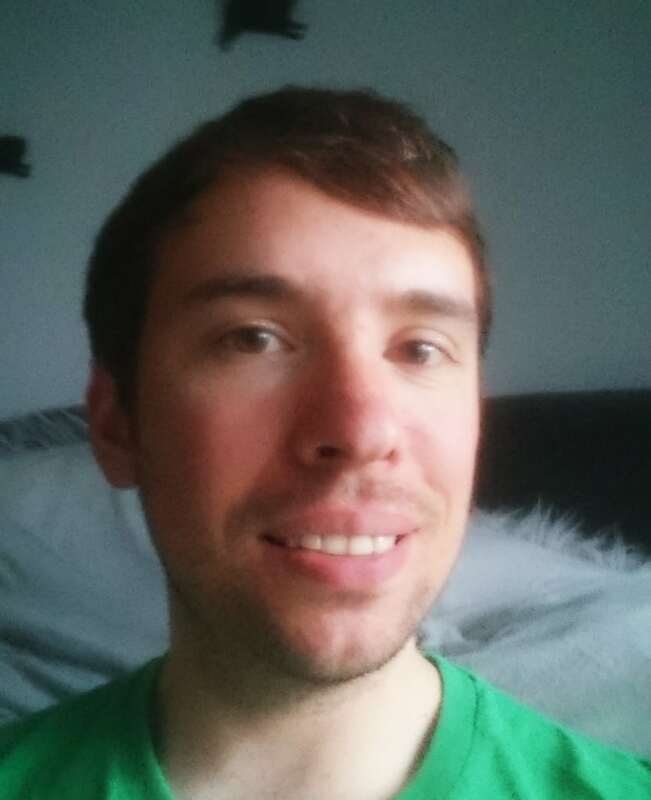 There are also different play-styles to pick from. For instance, you may want to upgrade your Stealth points, letting you sneak past vampire guards and other enemies. Alternatively, you can level up your Firearm skills if direct assaults are more your cup of blood. Best of all, the game still has a very loyal modding community, meaning tons of expanded gameplay tweaks are available for you to try. Without a doubt, Vampire: The Masquerade – Bloodlines is a classic among games like Deus Ex : Mankind Divided that’s worth every bit of your time. Read more honest player reviews of Vampire: The Masquerade – Bloodlines.